Over the weekend Joe and I were lucky enough to try out Saus, the new Belgian street food place down the street from Faneuil Hall. It was started by a couple of young people, who might be the same people working behind the counter when you are there, which is always cool. And they’re a non-bar open late every night, which is almost impossible to find right now. 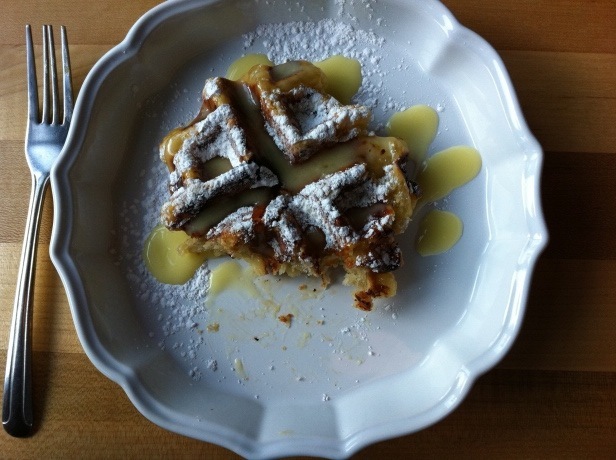 First we tried the waffles which were made of hefty yeasty dough, edged with sticky caramelized sugar. Delicious. I got lemon curd sauce and Joe got berry berry mixed with salted caramel. I liked mine the best. Obviously they immediately get points for serving it in a beautiful scalloped and lemon-curd colored dish. If you get it to go, which I will as soon as the weather shapes up, you just take a piece of tissue with it, street style. 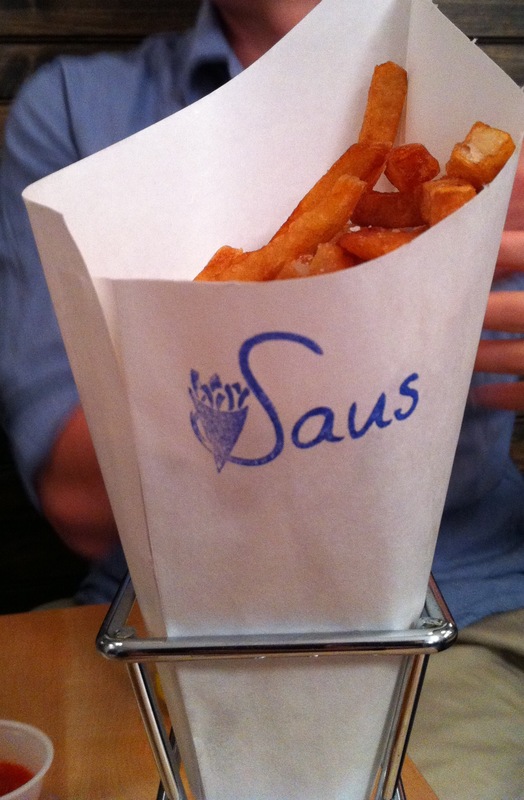 We came back that night for fresh, house-cut, crispy frites. We tried the garlic mayo, truffle ketchup and chive sour cream dipping sauces. The truffle ketchup was the table favorite. I love that this is a place you can meet friends, spend a few dollars, shares some fries, and head out. 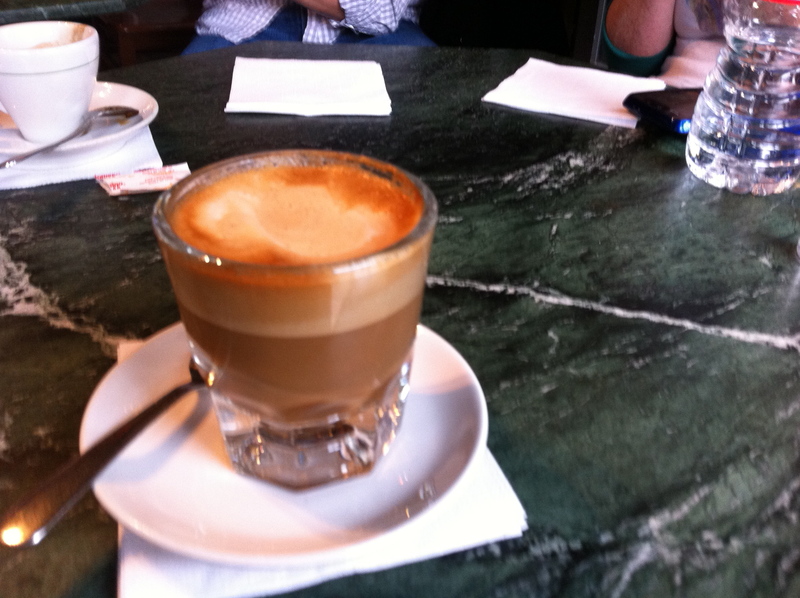 A more savory version of the coffee shop meet-up. 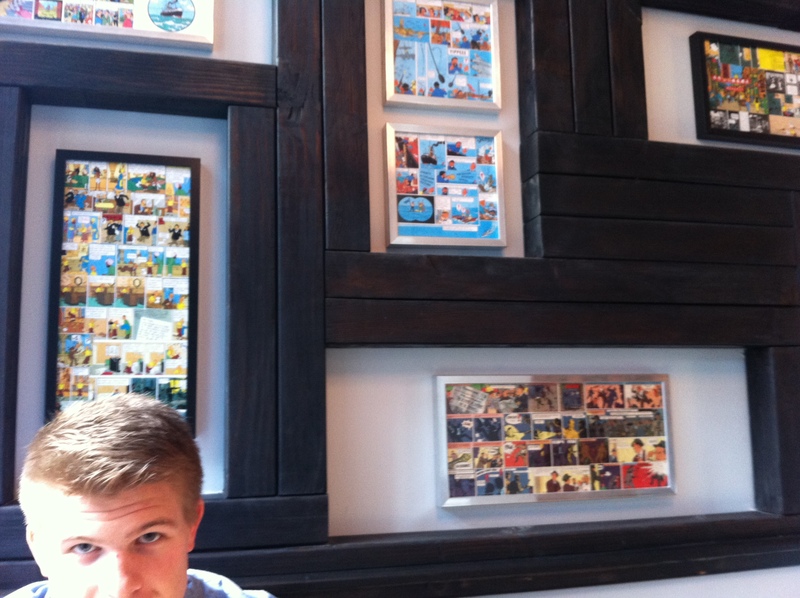 AND: their walls are covered with Tintin comics. Incidentally, they started tweeting their progress almost a year before they opened. If I hadn’t followed their progression on Twitter for so long, I don’t think I would have visited in the first week of their opening, or started telling my friends about them before they even opened. So, if you’re considering whether Twitter is worth your small business’s time: it is. Aleksandra also makes grilled cheese sandwiches with Gruyere and a sprinkling of white wine (before broiling), sliced comice pears sauteed in butter and sugar, coconut sticky rice, pasta with ‘just a little butter, Parmesan and black peper,’ and before bed a mug of hot milk sprinkled with freshly grated nutmeg…. In the winter, I have made hearty salads of smoked mackerel and red-skinned potatoes and accompanied them with braised leeks. I like to saute sausages and eat them with a mound of broccoli rabe, a lemon wedge and olive oil; and assemble platters of prosciutto, mortadella and duck liver pate with a tuft of parsley and caper salad. I might roast carrots and beets, and dip them into ricotta seasoned with olive oil and sea salt. This book is in the guise of a dizzy girl memoir, but it’s actually a beautiful pitch for savoring all the food you eat, and relishing the treats you allow yourself. 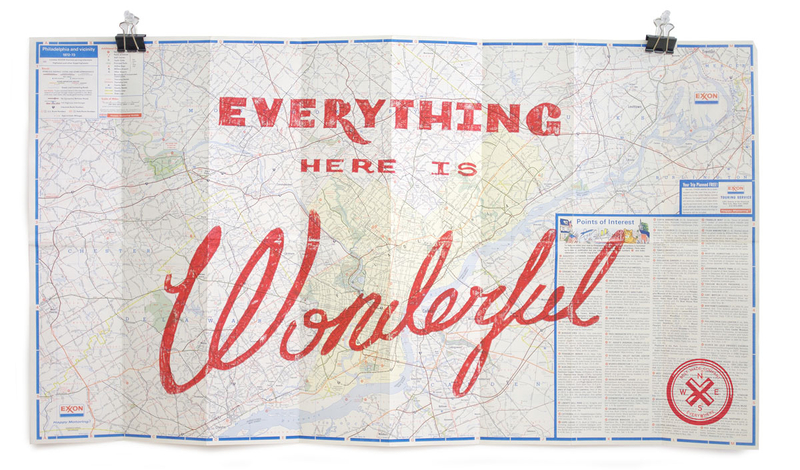 Map poster by Best Made Co. 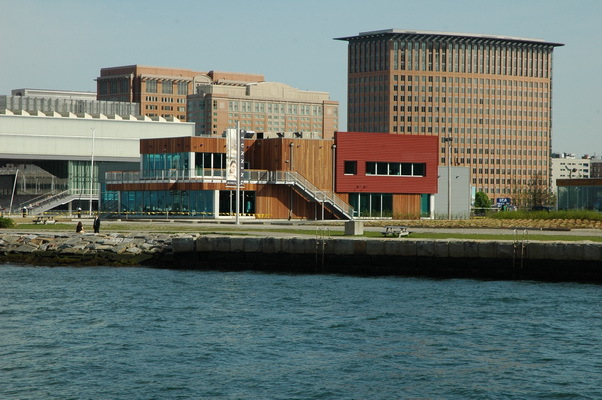 Here are some of my absolutely favorite things in Boston. To eat. When I think about travel, I think about finding things to eat. When people say it’s a walking city, they really mean it. We walk everywhere, and usually heading out to a new restaurant is the only way I find new corners of the city. Don’t visit in the winter. I do live here, so this list should be constantly updating. My list of Boston news tweeters, on Twitter. I live on Beacon Hill and see troves of people walking the brick sidewalks every day, enjoying their trip. Stop into Savenors and buy a Béquet salted caramel, take the footbridge over the the esplanade and walk along the river, sit in on a church service at The Church of the Advent, one of the loveliest churches in Boston. Turn left on Phillips St and go up a block to see the old world gorgeous displays and antique cooler at Rouvalis Flower Shop. My review of Beacon Hill, my neighborhood, on Nabewise. High Rise Bakery: a bit of a walk out of Harvard Square, a lovely walk unless it’s raining. Stone floors, group tables, deliciously intricate sandwiches. The Harvard Museum of Natural History has stately exhibits, but also softly lit corridors, stuffed animals you’ve never heard of, and intricate glass flowers neatly labeled and dusted. Border Café, right in Harvard Square is the most satisfying place for those craving big & strong margarita and bottomless chips and salsa. A favorite for me every few weeks. If you’re wondering how the Big Dig turned out, head this way. In the spring and summer the new parkway of grass, flowers, art, benches and fountains makes it easy to say it really was a good idea. Neptune Oyster: French mirrors, tiles, spinning barstools, bellini by the threes, mounds of lemons, small bingo sheets to order your oysters by. If you have the luxury, I suggest going in the late afternoon. It’s just down the street from Acquire, a wonderfully curated antique and art shop. Of the many Italian espresso bar options, Caffé Paradiso is my favorite for slinking up to the bar past the midday soccer-watchers and sitting down for a real Italian experience, like how you can stay as long as you like and don’t see the check until you ask for it (next to Modern Pastry). Saus: run by three young budding restauranteurs full of youth, optimism, and great taste, this place is the best thing to happen to the Faneuil Hall area in a while. A great stop if you get overwhelmed produce-shopping at Haymarket. They’re open late (rare! ), and waffles or belgian frites make for a way better coffee dates than ol’ Starbucks. Here’s my longer post about them. 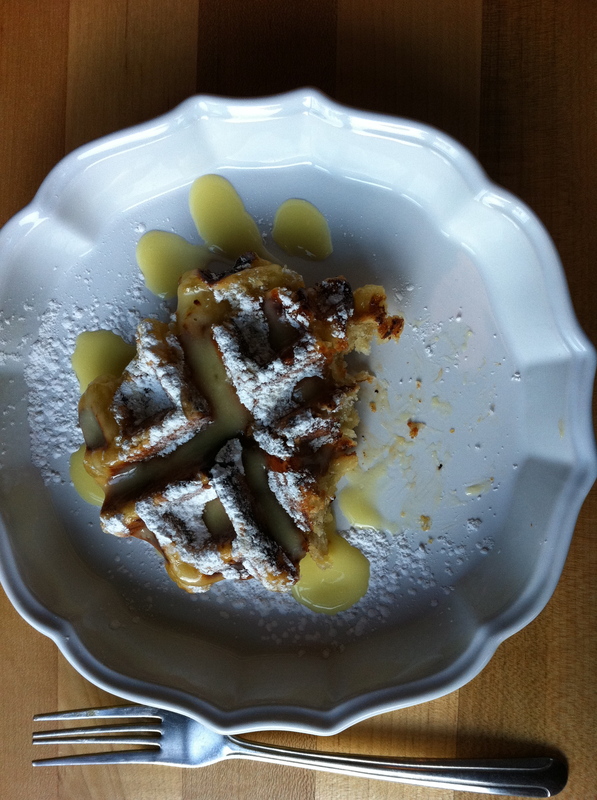 a Liege waffle with lemon curd at Saus. Baraka Cafe: one of the first places I take people out to eat. Cozy and tiny, Baraka completely transports you to Tunisia for your meal. Orange water essence lemonade, mint tea that makes you want to order just that, little plates of nuts, a platter of dates and cheese….it’s hidden just off Central Square but you will almost absolutely have to wait for a table for dinner. Cash only. Falafel King: the yelpers agree, it can’t be beat. I bought my office lunch here for almost a year and was never disappointed. I also haven’t found a better tasting one for…I hate to say…ever. Also: no one highlights for you how nicely falafel fills you up. Fast metabolism has it’s benefits, but I’m always hunting for food that won’t disappear in an hour and this. is. it. Meyers + Chang: a sassy asian diner with unbelievable food, catchy drinks and quick service. I haven’t made it to their Sunday $1 oysters + $1 pbr but don’t take my failure as any indication – it sounds epic! Here’s something: order the pork buns. Absolutely absolutely. Charlie’s Sandwich Shoppe: I don’t know how you feel about diner-type breakfast places, but this is the only legit one in Boston. Jump on Bus 43 outside Park Street Station and it will whisk you down to the South End for turkey hash, pancakes, snappy service, crowded menus, barstools. Cash only. Santarpio’s Pizza embodies the interior world of Boston to me. You come inside and it’s dim, but with plenty of room for everyone. You feel vaguely ignored, there’s barely a menu because it’s basically just pizza and lamb sausages, and then you order and the waiter slowly warms up to you until he’s sitting down at the booth and picking at your food. The pizza is delicious, the carafes of cheap wine remind you of Italy, and what the heck–you’ve never even been to this neighborhood before, much less realized it existed. I think the Beacon Hill Hotel is the most charming sleep spot in Boston. Breakfast in the French-bistro-inspired restaurant is included with your room, the evening bar crowd is framed by a roaring fireplace and stained glass, the windows overlook Charles Street. However–this is splurge territory–rooms with double beds run about $240 a night. Staying with the “location is best” theme, the Boston Park Plaza is located right on the garden, has regularly affordable rooms, and situates you within walking distance of nearly everything. Handy map from Start Here Boston, a city guide. 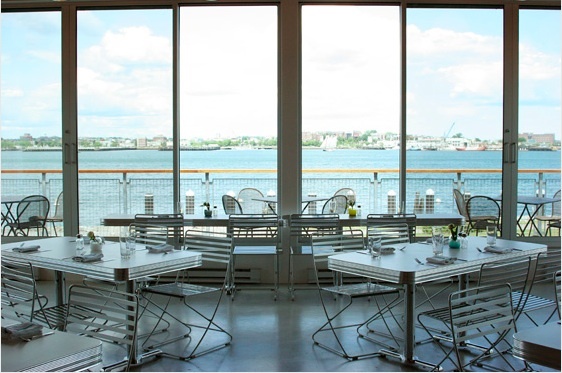 The new Louis Boston eatery looks like a lovely place for a summer lunch. Opening mid June, Sam’s will also gives you an excuse to see the store’s new building on Fan Pier (below). In other Boston food news, we went to Myers + Chang, just across the bridge in the South End, for Joe’s graduation dinner and it was truly delicious. Their theme is asian diner which seems to me the very definition of funky, or at least what I’ve always wanted it to mean. I loved it and can’t wait to go back in the fall. If you need an excuse to go, on Sundays they do $1 oysters with $1 PBRs (tall boys, even). PS And of course I can NOT wait to try Saus when we get back. Say the words “frites” + “mayonnaise-based sauces” + “open late” and I will nominate you for mayor of Boston.